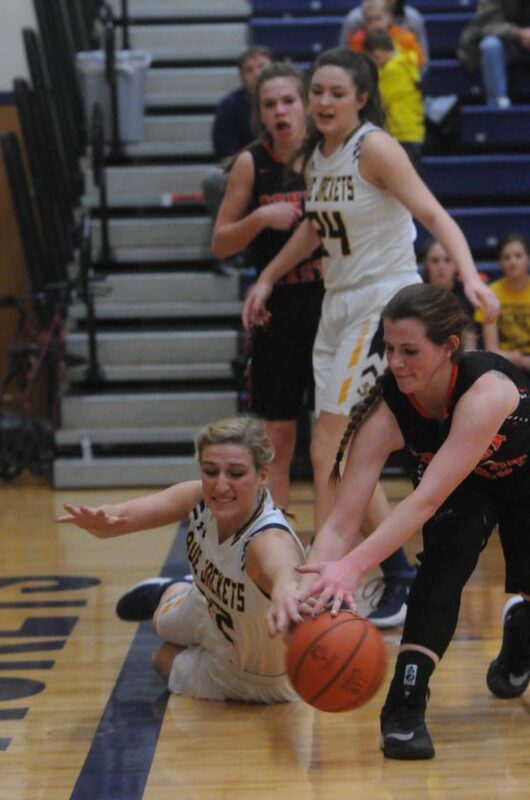 PHOTO BY JONATHON BIRD New Riegel’s Lindsay Bouillon falls to the ground while going after the ball against Seneca East’s Bonnie Bivens as Seneca East’s Jessica Bowerman and New Riegel’s Kaitlyn Kirian look on during the second half Saturday in New Riegel. NEW RIEGEL — New Riegel got the stop it needed defensively. All the Blue Jackets had to do was wait to either run the clock out and celebrate a win, or be fouled and go to the free throw line and earn the win there. Seneca East junior Marina Adachi had other ideas. Adachi stepped in front of a pass, scored, and then provided great help-side defense on Brianna Gillig’s final shot as the Tigers escaped New Riegel with a 47-46 non-league win Saturday. Adachi was fouled on the go-ahead basket, but she missed on what was her only free throw attempt of the day. The Blue Jackets first called timeout before Seneca East (9-2) used its final timeout as well. Gillig’s shot hit the front rim as time expired, sealing the win for the Tigers. Freshman Jessica Bowerman split two free throws to push Seneca East ahead, 43-42, with 1:28 left. On the other end, Bonnie Bivens, who tallied a double-double of 14 points and 10 rebounds, committed her fifth foul when she fouled the Blue Jackets’ Kaitlyn Kirian. Bivens left the game as Kirian made both free throws, giving New Riegel (3-6) its first lead of the second half. Seneca East immediately went to work as the clock ticked under one minute to play. To that point, only three Tigers — Bivens, Bowerman, and Adachi — had scored. But, off of a missed shot, Caylin Quiggle grabbed the rebound and put the ball back up and in for a 46-45 lead with 52 seconds left. Brooklyn Gillig was fouled on the other end, drawing a one-and-one opportunity. After making three of her first four free throws, Gillig missed her third in a row, but Brianna Gillig grabbed the rebound and scored with 33 seconds left. Seneca East missed a shot on the other end before Adachi’s steal and layup for the win. The Tigers jumped out to a 7-3 lead only to watch the Blue Jackets reel off the next 12 points. A 3-point play by Kirian and a free throw by Brooklyn Gillig aided New Riegel to a 19-11 lead after eight minutes. Kristin Coleman scored in the second quarter for the Blue Jackets for a 25-18 lead, but it would be the last points of the quarter for New Riegel. Bivens made two free throws and then scored after a New Riegel timeout. Bowerman drilled a 3-pointer before buckets from Adachi and Bivens gave Seneca East a 29-25 lead at halftime. Bowerman scored the first bucket out of the half, ending a 13-0 run over 6:05 for the Tigers. The Blue Jackets got back within three points when Kirian scored with 2:26 left in the third quarter, but Adachi connected on a trey and Bivens split a pair of free throws, giving Seneca East a 39-32 lead after three quarters. Brianna Gillig was held scoreless over the middle two quarters. Bowerman tallied 17 points and seven rebounds for Seneca East, while Adachi added 14 points. Kirian finished with 17 points and 11 rebounds for New Riegel, who made just 14 of 24 free throws, including just 7 of 15 in the second half.